Chef José Matamoros was born in Chihuahua, Mexico where he grew up and lived until his 20’s. 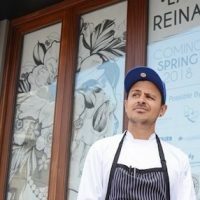 After graduating from University, José moved to Toronto, Ontario in 2006, where he realized cooking was what he loved and formally started working as a cook. His first real kitchen job was at the “Little Fish” in Toronto with Chef Carey Wesenberg, whom he considers his first mentor; then he moved to the Distillery District where he worked at Pure Spirits and El Catrin for 6 years. In 2015 he joined Stratford Chefs School and after graduating was granted the opportunity to work at La Grenouillere in France and Villa Mangiacane in Italy. Currently he’s the Chef de Cuisine at La Reina restaurant in Guelph where he cooks Mexican food with his best friends.